Hoobastank -- "Crawling in the Dark"
Bruce Almighty stars Jim Carrey as Bruce Nolan, Jennifer Aniston as Grace Connelly (Bruce's girlfriend) and Morgan Freeman as God. 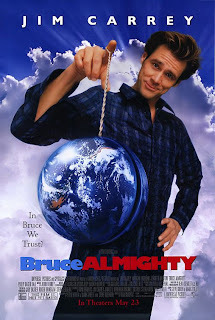 Bruce Almighty makes some surprisingly poignant statements about the God's interaction with human beings. In particular, the movie goes to great lengths to demonstrate how much better the world is when people surrender to His divine know-how. By the film's end we learn that God is infinitely smart and capable; therefore we should trust Him. It turns out that Jennifer Aniston is a dedicated woman of prayer... who woulda thunk? After Bruce assumes (many of) God's responsibilities, he finds out that most of her extensive prayer life was dedicated to interceding on his behalf. She prayed a lot for Bruce, which led to God showing up in Bruce's life in a way that would transform his perspective and renew his sense of purpose forever. Thus, something else this movie demonstrates: God answers persistent prayer. This is a bold statement coming from a Jim Carrey movie. "Jesus told them a parable to the effect that they ought always to pray and not lose heart..."
i wonder though, with this movie, would anybody not specifically looking for this message actually find this message? Interesting content and approach to film reviews. Thanks for reaching out. it's hard to deny that this movie is about people's (or one person's) interactions with God. The makers of this movie go out of their way to show how Grace's prayers affect Bruce's relationship to God.